If you're in an industry that sells or distributes products that require temperature-controlled containment, such as pharmaceuticals or food items, you know that transportation costs can weigh heavily on your overhead. This is particularly true if you move either climate-sensitive or refrigerated freight that doesn't need the amount of space that full-size dedicated transportation units offer. To save on space and reduce freight costs, there are several temperature-controlled shipping options at your disposal. These options can range from low-end insulated coolers to larger units with state-of-the-art climate-controlling hardware. 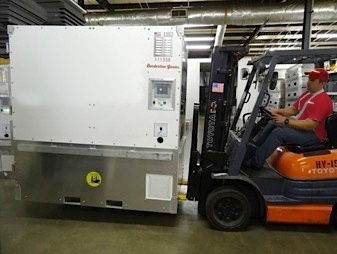 While a cooler or insulated package can be a great solution for short distances, many products require better control over temperature, security and contamination prevention. In fact, many products are regulated by law to ship under strict temperature-controlled settings and to be isolated from other products to prevent contamination. If your commodity requires cold chain monitoring and doesn't require an entire truckload for transportation, there are less-than-truckload solutions to meet your needs. One unique shipping option for these types of products is the Climate-Controlled LTL Unit. The base dimensions of this specialized unit is roughly the size of a standard pallet, which makes it possible to transport via traditional less-than-truckload (LTL). Utilizing an LTL temperature-controlled shipping service versus a traditional refrigerated trailer can result in significant cost-savings. For example, we compared the quotes of a dedicated refrigerated freight trailer (also known as a reefer) from Florida to Tennessee against a Climate-Controlled LTL Unit shipment to and from the same locations. Data is invaluable for many reasons, especially with high-value freight. The Climate-Controlled LTL Unit is equipped with technology that tracks several points, including internal and external temperatures and GPS points throughout transit. Click the link below to view a comprehensive sample report from a recent shipment of vitamin supplements. Specialized LTL refrigerated freight and temperature-controlled shipping solutions may help you cut your costs significantly. In some instances, however, a dedicated reefer trailer or box truck may just make more sense. It's always best to check all of your options. Always ask your transportation and logistics provider to help you make the right choices with your heated and refrigerated freight needs. It could end up saving you hundreds of dollars!